Should Knicks Ditch 3 Star Plan? Today, Marc Berman of the NY Post wrote an article about how Dallas has shown that the Knicks should change their 3 star plan. 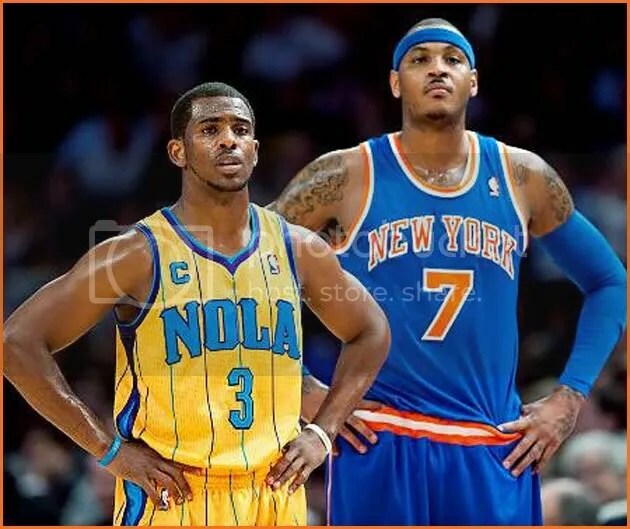 The 3 stars being Amare Stoudemire, Carmelo Anthony and hypothetically, now New Orleans point guard, Chris Paul. I’m not sure that Miami’s collapse suggests that the Knicks need to scratch the 3 star plan because I think the 2 situations are completely different. Having a big 3 with a Chris Paul versus Chris Bosh is completely different. One of the great positives of Chris Paul is that he makes everybody better on offense and he’s a great defender. Bosh adds a 3rd scorer to LeBron and Wade but he doesn’t pass to make people better and he’s not a great defender (see Dirk at the end of game 2 of the finals). Depending on the new CBA the Knicks may be able to afford Paul or they may not be able to. Depending on the new salary cap figure / whether or not it is a hard cap, the Knicks could be able to get Paul cheaper and maybe add a decent piece or two. Miami did well in that they had the big 3 signed to less then max deals and they were able to sign Udonis Haslem and Mike Miller. Amare and Carmelo are both signed on max deals and the NBA doesn’t allow, or doesn’t allow under this CBA, the ability to take a pay cut while in contract. I am a big proponent of team depth. We have enough firepower with Amare and Carmelo and I would not be opposed to bypassing CP3 and signing a veteran point, a center and some bench pieces. Right now, with all the CBA uncertainty, I think it’s a bit of a waste to discuss this. While it is interesting to discuss, nobody knows what the terms of the next CBA are. Depending on the cap number, CP3 may not even be a possibility and then the 3 star plan will have to be scratched. I think there are pros and cons to both plans but this cannot be seriously discussed until we know the terms of the next CBA.